A month long active campaign against Endosulfan the killer pesticide that has affected over 9000 victims and killing more than 1000 in Kasargode, Kerala and Southern Karnataka over 25 years) initiated by the Peoples’ Solidarity Concerns – Bangalore (a forum of different activist,human rights and political groups which includes the New Socialist Alternative- CWI India) culminated on 5th June with a convention and a protest at Town Hall in Bangalore. The campaign included a photo exhibition of Endosulfan victims by the award winning photographer Madhuraj from Kasargode (Kerala) which was held at various locations across Bangalore. Despite few resources available in terms of manpower or financial backing, the campaigners did an exceptionally good job in collecting over 3500 signatures in the ongoing petition campaign as well collect over Rs. 30,000 as campaign fund. The photo exhibition series which started on 9th May has traveled across various prominent locations in Bangalore including Gandhi Bazar, Ramakrishna Square, Srinagar, Jayanagar 4th block, Nittur Srinivas Rao Circle and the still ongoing photo exhibition at Rex Cinema (Brigade Road). The photo exhibition is also traveling other districts of Karnataka such as Hassan, Mysore, Belthangady etc. In the course of the Bangalore campaign, on 13th May, a protest rally was organized by Srushti Kalalayam an art and activity center for Kids, situated in Gandhi bazar brought out more than 150 children to a Ban Endosulfan rally. Primary and middle school kids carried photos of Endosulfan victims, shouting enthusiastically against the killer pesticide and demanding an immediate ban on it. This campaign has come at a time when 20 state government across India including Karnataka govt. 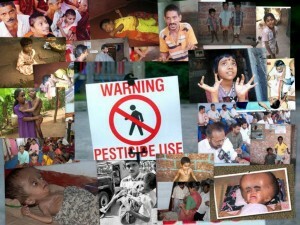 (which true to its character has flip-flopped on the issue, reneging its earlier stance of a temporary ban) have come out favorably on the use of Endosulfan despite its known deadly effects such as limb deformities, loss of nervous functions, brain damage, delayed puberty, other gynecological problems and congenital defects in children due to its persistent long term presence in the environment. 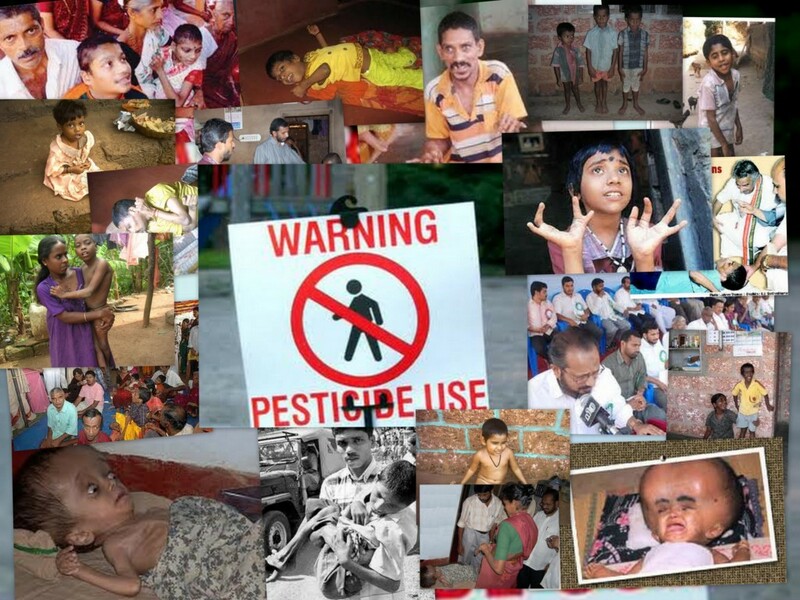 Despite over 74 countries banning the deadly pesticide citing the effects on Kasargode (India), Indian govt. has preferred the ostrich approach (due to pressures from Agro industrial lobby) by burying its head in the sand when all the evidence have gone against the use of Endosulfan. In its true tradition of trying buy time and making half-hearted (devious) attempts in trying to please everyone by saying it will ban Endosulfan in a phased manner until alternatives are found, cunningly at the same time obtaining exceptions for 22 agricultural products (which include products that we daily consume such as Rice to Tea and Coffee to Curry leaves) at the recent UN Geneva convention. Indian govt. is just trying to play hide and seek with the victims of Endosulfan and the people of India before finding the ways and means to completely side line the issue. Though the convention held on 5th June did not attract much of a crowd (due to the large marathon organized by the Tatas in commemorating World Environment Day! ), the event nevertheless went on with a film screening (‘After the Deluge’ which was made by the Endosulfan Protest Action Committee), presentations by Sudhir Kumar (Convenor – Endosulfan Protest Action Committee), Suresh Heblikar (noted environmentalist and filmaker). K P Sasi, (Radical film maker and political activist) and discussions on how to move the campaign forward from Bangalore to the other districts of Karnataka and beyond. Overall, though it was a small beginning given the scale of the resistance by both the govt. and corporate lobby, nevertheless it was a significant step especially in terms of taking on the agro chemical industries that have literally ruined and polluted the entire countryside by promoting the reckless use of chemicals and fertilizers. Endosulfan is a case in point on the daylight murder carried on over 25 years and yet neither the govt. nor the corporates have no remorse. If anything, they want more such programmes! But what is also important to remember is that the culprit is not just Endosulfan but the entire green revolution technology itself with emphasis on chemical fertilizers, pesticides (ultimately poisoning the consumers), cash crops, water intensive and input based agriculture coupled with lack of land reforms and redistribution plus neoliberal policies that has resulted in the complete ruining of the agriculture production in India. Only a thorough overhaul of the system by implementing not only land reforms and redistribution but also adapting alternate methods such as organic farming, agro forestry and other sustainable, eco friendly methods under Democratic Socialism would it be possible to imagine a future for humans and nature to live in peace and harmony. we must see our future in organic farming ONLY.